It is said that there are more PGA Tour golfers in Florida than anywhere else in the planet. It is certainly true that Florida is a golfer’s paradise. And the area of Central Florida around Orlando is blessed with more than its fair share of world-class golf courses. Ellis Exclusive Villas is lucky enough to rent property on a number of resorts with their own fantastic golfing facilities and courses. Here are a few golf resorts on which we rent homes. Providence is just 20 minutes from Disney World, but feels a world away. If you want full resort amenities during your Orlando vacation, including a lively clubhouse and your choice of resort pools, Providence is an ideal choice. Just 10 minutes southwest of Disney World, Highlands Reserve is another Michael Dasher designed course. Highlands Reserve is unusual because of the elevation – spanning 120 feet across the course. View homes on Highlands Reserve. Ridgewood Lakes is another family-friendly landscaped resort in Davenport with a great selection of vacation rentals, although further south than the other two golf communities on which we have homes. The golf course is a fun course, perfect for all abilities. The resort is close to the Posner Park retail mall and is around a twenty-minute drive from Disney. Book a tee slot via the Pro Shop on (863) 424-8688. View homes on Ridgewood Lakes. Even if you aren’t lucky enough to be staying at one of our properties on these fantastic golf resorts, there are plenty of opportunities to indulge in a little golf around Kissimmee, Davenport and Orlando. Around Disney World, you’ll find a wealth of courses that are open for the public to enjoy. Here are some of our favourites. Shingle Creek Golf Club boasts an 18-hole, par-72, 7,213-yard championship course; a recently remodelled course, newly conceived and executed by the Arnold Palmer Design Company. In addition, there’s the Brad Brewer Golf Academy, a luxurious spa and fitness centre, hotel and conference facilities. Built on one of the highest elevations in the Disney area, Mystic Dunes sits on more than 600 acres of rolling hills, with the tropical landscaping including two lakes and 36 bunkers (nine of which are Mystic Dunes’ signature whiskey barrel bunkers). With the course designed by champions tour player and NBC golf analyst Gary Koch, you can expect of Par 72 golfing adventure over 7,012 yards. Orange Lake Golf and Country Club offers visitors a choice of two 18-hole courses and a nine-hole course. The 18-hole championship course designed by Arnold Palmer, The Legends at Orange Lake Resort, combines Scottish-style golf on the front nine; with the towering pines, majestic oaks, winding fairways and flowing water of the back nine reminiscent of the Carolinas. The other 18-hole course, The Reserve at Orange Lake, showcases carefully preserved wetlands for a natural Florida experience. There is also a par-30 executive 9-hole course; Cranes Bend at Orange Lake Resort. ChampionsGate is an Orlando stalwart, one of the first Orlando courses to really be a destination in its own right. With 36 holes of championship golf designed by golf legend Greg Norman, ChampionsGate is also home to the international headquarters of the renowned Leadbetter Golf Academy. Falcon’s Fire Golf Club is known for its Rees Jones designed championship golf course which stretches over 7,000 yards from the back tees with a choice of four sets of tees. A very central, challenging yet playable course with a welcoming clubhouse which offers guests complimentary valet parking, club cleaning and golf carts equipped with GPS navigation. Falcon’s Fire golf academy offers group, individual and junior lessons. This is renowned fun and challenging course at the Orange County National Golf Centre and Lodge features significant elevation changes, rolling fairways and large, contoured greens. It has fewer trees and wider landing areas than it’s the other Orange National course, Panther Lake. This, with the native heather framing the fairways, gives Crooked Cat more of a links-style look; and is one of the most naturally beautiful Orlando golf courses. The Orange National also boasts a Tooth nine-hole walking course. These courses are convenient for all of our vacation homes, with journey time being little over half an hour in most instances. 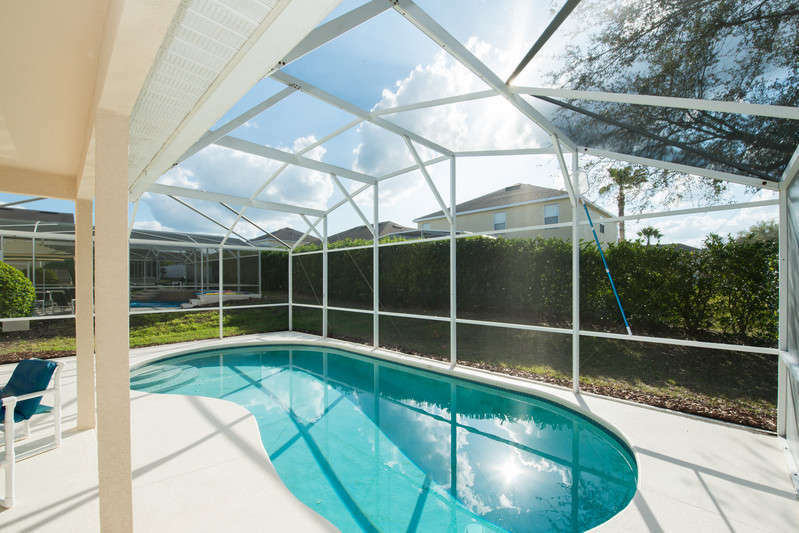 If you are interested in a golfing break in Orlando, view our unbeatable choice of Orlando vacation homes now. "Nous avons passé un très bon séjour dans la villa proche."